Last week I posted a few links about cold and flu survival tips. 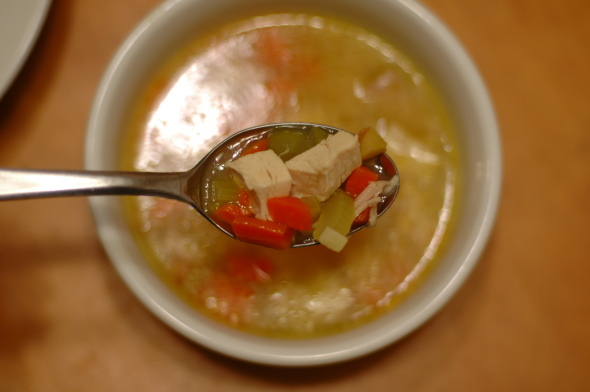 The link from Stupid Easy Paleo was a recipe for Healing Chicken Soup. And since my girls came down with a cold last Friday, I knew it would be the recipe for our Sunday Soup. I omitted the mushrooms and green onions, and just added what I had on hand–carrots and celery. Check out the recipe to read the healing benefits of bone broth, garlic, turmeric, and ginger. I thought it was delicious and even my husband gave it a thumbs up! It’s definitely a comforting soup to make if you are feeling under the weather. Yes, it’s true. Chicken soap is excellent for healing colds and flu.. It has some anti-inflammatory and moisturizing properties. In general is good for anyone who feels weak.